The oxidation number of barium in barium diiodide is 2. 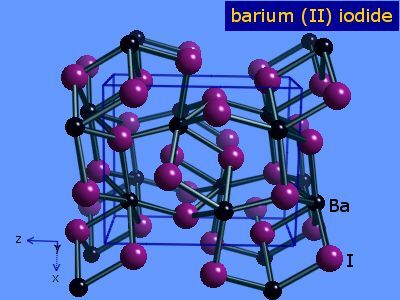 Barium iodide is made by the neutralization of barium carbonate with HI in water. The product crystallizes as the hydrate BaI2.2H2O [7787-33-9]. If this heated, dehydration to anhydrous BaI2 occurs. It is also made by the reaction of BaH2 with ammonium iodide in pyridine. The table shows element percentages for BaI2 (barium diiodide). The chart below shows the calculated isotope pattern for the formula BaI2 with the most intense ion set to 100%.